Russell Goldsmith was joined in the studio by three fellow podcasters. Neville Hobson, with over 800 shows and 10 years of podcasting experience with the Hobson & Holtz report, a podcast that is a key part of the FIR Network that he launched with Shel Holtz. Tom Ollerton, Marketing and Innovation Director at We Are Social, and Alastair Cole, Chief Innovation Officer at Partners Andrews Aldridge, who together, produce the Innovation Ramble, a podcast that only launched a few months ago but that has had the backing of The Drum. 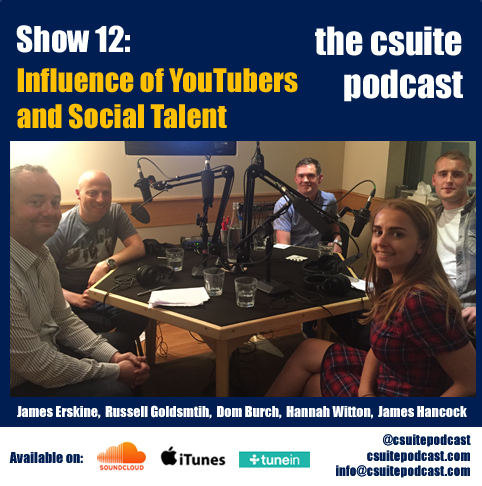 The aim of this episode was to investigate how brands and organisations could use podcasting as part of their communications mix, be that sponsoring existing content or creating their own. There were a number of take outs from the show and tips that were provided. Tom’s view was that podcasting is a long form format, something you can listen to on a walk or the commute, although Neville stressed the fact that you can, of course, listen to podcasts whilst doing other things, unlike video or the written word. In that respect, it’s no different to radio, which as the latest RAJAR figures will show, is listened to more than ever in the UK. Podcasting appears to be far more popular in the US than in the UK, which, in Neville’s opinion, is because the UK has excellent radio programming, [listen to our show about the power of radio] but that’s not the case in the US. This therefore drove the popularity of podcasting there as people looked for alternative audio content to listen to. With regards to the question of how brands can get involved in podcasting, Neville believes it all comes down to what the goals are. For example, is it simply to generate brand exposure or perhaps be seen as a subject matter expert? However, one of the issues that may arise, is that many brand owners may have unrealistic expectations due to the huge exposure that Mailchimp gained from sponsoring the incredibly successful ‘Serial’, which has arguably created a resurgence in podcasting. Tom pointed out that Serial is an anomaly and was a year’s work with some of the top radio people putting it together, and he felt that brands are missing a trick if all they are looking for is a ‘killer’ CPM. He thinks the opportunity for brands is to innovate with the format, rather than stick their advert at the beginning, middle or end of the format. He suggests brands should concentrate on creating their own content, particularly given it is relatively cheap to do and therefore recommends finding an opportunity, producing a pilot, and if no one downloads it, to pivot, iterate, change and do it again. Tom said that you can roll out ten different podcasts on ten different subjects, look at the data and see what is connecting with people. Neville added to this in that he believes what it comes down to is having compelling content, telling a phenomenal story and ensuring there is something different about you to other podcasts. For him, podcasting is not about mainstream media type numbers, but instead, it’s about the small niche audiences that are interested in a specific topic. Neville therefore thinks that brands would be more satisfied if they thought like that about the medium rather than thinking about ‘mega’ numbers. Alastair agreed and said that the right way to go is for brands to be looking to ‘scratch their own itch’, i.e., find something that they are genuinely passionate about. The show also featured a short interview Rachel Miller of All Things IC, who produces a podcast on Internal Communications.